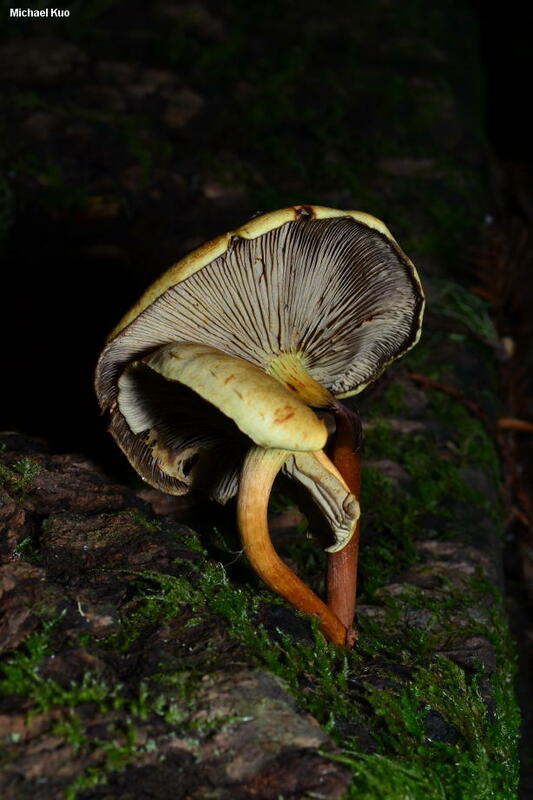 This widely distributed mushroom is often found in colder weather, fruiting in large, striking clusters on the deadwood of conifers or, more rarely, hardwoods. 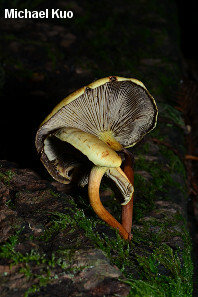 When fresh, the clustered caps are usually described as being bright yellow to greenish yellow--as are the gills and stems--but the cap colors are extremely variable and, in my collecting experience, the photogenic yellow specimens one sees in field guides are actually less commonly encountered than specimens demonstrating a slew of other cap colors: reddish brown, orangish brown, orange, brownish, and even whitish when specimens are very mature. 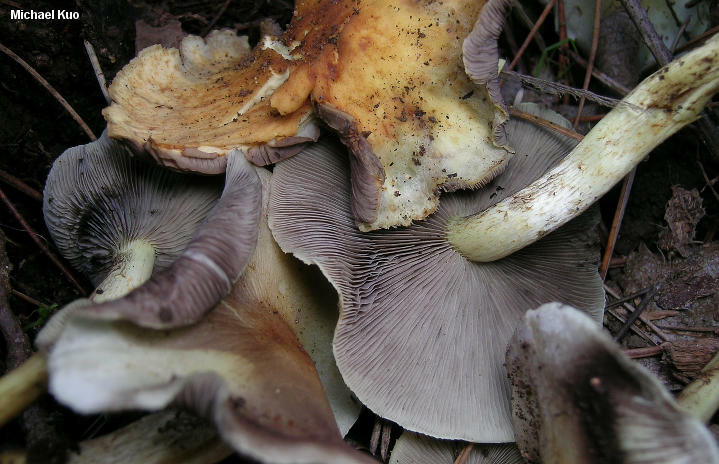 The spore print is purple-brown, and with older specimens you can frequently check this out in the field, due to the clustered growth pattern, by simply lifting a few caps that have covered others. Naematoloma fasciculare is a synonym. 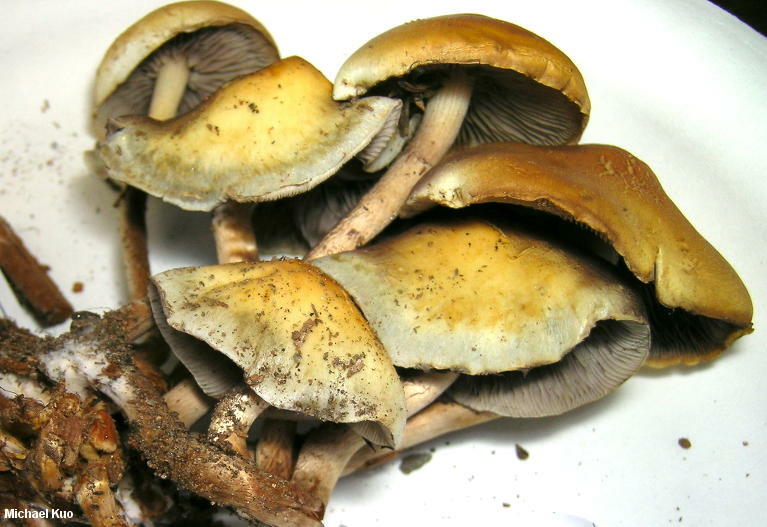 Although it has been synonymized with Hypholoma fasciculare, "Hypholoma subviride" is sometimes treated as a separate species from Cuba, Puerto Rico, Florida, and the Gulf Coast. 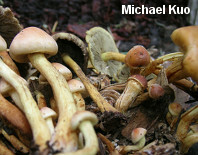 The caps for Hypholoma subviride are smaller (1-3 cm across); spore sizes are virtually identical. 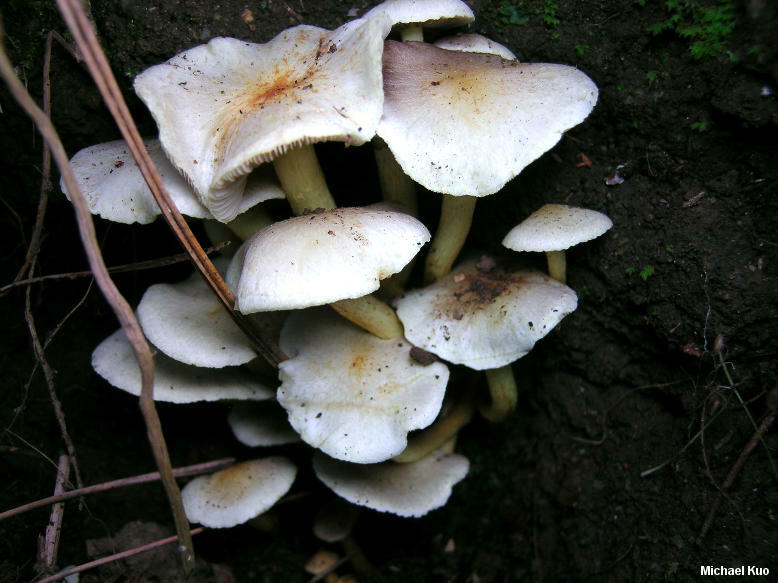 Ecology: Saprobic; growing in clusters on decaying logs and stumps of conifers and, rarely, hardwoods; fall and winter, sometimes in spring; widely distributed in North America, but more common along the West Coast and in montane or northern areas. The illustrated and described collections are from California, Colorado, and Illinois. Cap: 2-5 cm; convex, becoming broadly convex or nearly flat; bald; dry; when young often tawny reddish brown or orange, but usually becoming bright yellow to greenish yellow or golden yellow, with a darker center; the margin often featuring small, wispy partial veil fragments. 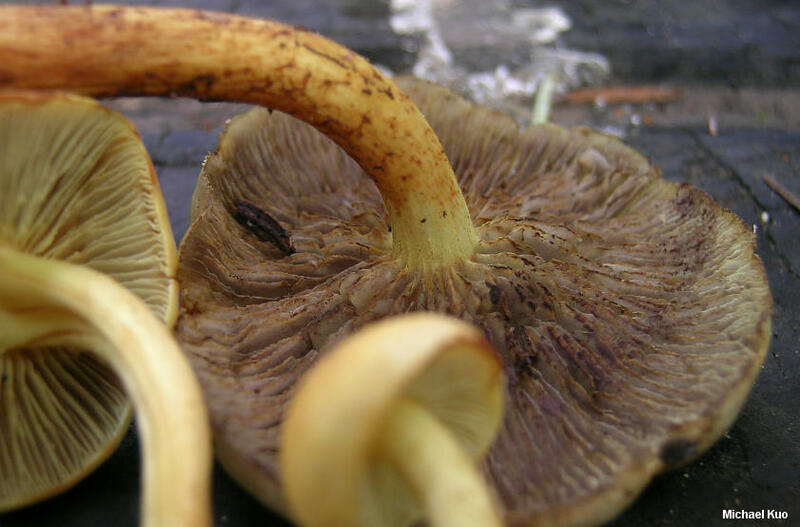 Gills: Attached to the stem or pulling away from it; close or crowded; yellow, becoming olive or greenish yellow, and eventually dusted with spores and therefore spotted purplish brown to blackish; short-gills frequent. Stem: 3-10 cm long; 4-10 mm thick; more or less equal, or tapering to base; bright yellow to tawny; developing rusty brown stains from the base upwards; a bright yellow cortina present in buttons, but soon disappearing or leaving a faint ring zone. 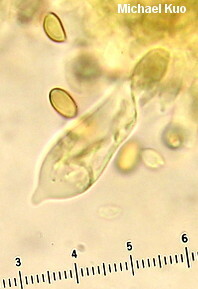 Microscopic Features: Spores: 5-8 x 3-4.5 µ; ellipsoid; smooth; thin-walled; with a pore; yellowish in KOH. Pleuro-chrysocystidia fusoid-ventricose to mucronate; to 40 x 10 µ. Pileipellis a cutis or ixocutis; elements encrusted. REFERENCES: (Hudson, 1778) Kummer, 1871. (Fries, 1821; Saccardo, 1887; Smith, 1949; Smith, 1951; Smith, 1975; Stamets, 1978; Smith, Smith & Weber, 1979; Weber & Smith, 1985 [H. subviride]; Arora, 1986; Phillips, 1991/2005; Lincoff, 1992; Metzler & Metzler, 1992; Evenson, 1997; Barron, 1999; Roody, 2003; McNeil, 2006; Miller & Miller, 2006; Trudell & Ammirati, 2009.) Herb. Kuo 10029601.